We now pick up where we left off in part Three of this article; as we began to examine the first four ‘harbingers’ and their accompanying ‘seals’ we saw that Jonathan Cahn presented some aspects of truth and true accounts – but then learned the full story from David James on those facts that Cahn left out, which altered the entire picture and leads us to entirely different conclusions than where the author of The Harbinger would have us believe. ~ Fact concerning Israel: Israel would use the quarried and dressed stones to rebuild, rather than clay bricks, which had been used to build the original structures. ~ Claim concerning America: A quarried Adirondack stone would be the cornerstone of the new World Trade Center tower. According to Mr. James, the Freedom Tower’s design never intended on using stone in its construction any more than the original towers were built of bricks. A cornerstone was quarried from the granite of the Adirondack mountains and set in place at Ground Zero (July 4, 2004), a few stories below street level for the foundation of the new WTC building but when the plans changed it was given back, sitting unused. Then in 2009 the Freedom Stone was rededicated and relocated to a memorial garden in Hauppauge, New York (about 50 miles from Ground Zero). Thus the prophecy of using stone to rebuild the Tower was never even close to being fulfilled in any way, and this invalidates this ‘harbinger’. Mr. Cahn is undeterred however; speaking through the characters of Kaplan and the Prophet, he claims that the laying down of the Freedom Stone was a fulfillment of a prophetic sign, and that it’s removal was a part of the judgment from God. That just as the stones of ancient Israel were demolished and destroyed as God’s hand moved against that nation in righteous Judgment, so likewise the Freedom Stone. However, how are we to know this and verify this aside from Mr. Cahn telling us so? ”Another problem is the idea of the Freedom Stone being a ‘Gazit Stone’. Except for its first mention, the ‘Gazit Stone’ is always capitalized in the book” (Mr. James quotes a paragraph in which this phrase is used five times) and because it is always so, the every day reader would assume that this is a special stone that was laid down when Israel began her rebellious building project. There is no such thing as a “Gazit Stone” in any special sense; “gazit” is a generic Hebrew term that refers to “quarried” or “cut stone” (Strong’s Lexicon of Hebrew words for "gazit"). The Freedom stone on the other hand was a specific construction for the specific foundation of the Freedom Tower. Mr. Cahn attempts to use the general in reference for the specific, which in this case is fallacious. David James states further: “They didn’t build with the Gazit Stone; they merely built with gazit – it was simply building material.” In all eleven instances in which the word “gazit” appears in the Old Testament it merely refers to cut stone, building material; except in perhaps a couple places, it deals with all of the building stones, collectively – never a single, ceremonial stone of any special significance. ~ Fact Concerning Israel: Many or most of the fig-mullberry trees (sycamores) were cut down by the Assyrians as part of their assault on Israel. ~ Claim concerning America: A lone American sycamore stood in the courtyard of St. Paul’s Chapel in the shadow of the World Trade Center and was knocked down as a result of the collapse of the buildings and flying debree. “This is yet another forced parallel that does not withstand closer examination. First, the sycamore (fig-mullberry) of ancient Israel and the American sycamore are two completely different trees that are unrelated in any way. They are not the same species (Ficus syomorus versus Plantanus occidentalis). They are not the same genus (Ficus versus Plantanus) and not even in the same family (Moraceae versus Platanaceae.). Mr. Cahn attempts to link an association between these two very different species of trees on a linguistic basis; but as the old expression goes “a rose is still a rose by any other name”. One cannot draw association between species, genus or family based on similar linguistic terms; any connection between relations of any life form (certainly including trees) must be according to their biological designation. The word for ‘sycamore’ in English could be attributed to those trees growing in Israel as well as the United States (though the tree in Israel was fruit bearing, shaqam), but in the Hebrew language these trees had different names because they were different sorts of trees! "The following example from English to Hungarian illustrates the fundamental flaw in the author’s linguistic argument. In Hungarian, the word kocsi can mean either automobile or wagon (horse drawn), but they cannot be used interchangeably in English. Even if one were to install an engine to power a horse drawn wagon in order to make it auto-mobile, it would still not be an automobile. "Yet this is precisely the type of mistake that Cahn makes in The Harbinger." Another point that David James makes addresses the intentions of the Assyrians and the attackers of 9-11. In the former instance, the sycamore trees were intentionally cut down (perhaps to make siege engines) or destroyed as specific targets as a means of ruination of the land. In the latter instance however, the single American sycamore at St. Paul’s church was destroyed but not intentionally so; it was an accident, incidental, collateral damage – and it had no impact on the nation. ~ Fact concerning Israel: Israel declared they would plant with cedars of Lebanon to replace sycamores in defiance of the Assyrians who cut them down and in defiance of God who had sent them to judge the nation. ~ Claim concerning America: A Norway spruce was planted at Ground Zero to replace the sycamore as an act of defiance just as did ancient Israel. Despite any comparisons and supposed connections between the sycamores of Israel (the fig-mulberry) and the American sycamore, there isn’t any. They aren’t even in the same botanical family, as Mr. James points out. Even in his use of the Erez tree, his usage and the way that the Bible uses this word are different – and yet, he equates the one with the other, when in fact his evidence contradicts the biblical evidence. Mr Cahn attempts to persuade the reader that the spruce that replaced the sycamore at Ground Zero exactly matched the cedars in Isaiah 9:10 (“A particular kind of cone-bearing evergreen” says the Prophet in the story), which according to The Harbinger, this match is due to the fact that cedar and spruce trees are both part of the same broad category. He appeals to the Hebrew erez as meaning ‘cedar’ in English versions of the Bible, which according to the commentaries he cites, “is most likely a generic word for pine family”. 1. In Isaiah 9:10 “cedars is the translation of the plural of the Hebrew word erez (erezim). 2. Erez is used in sixty nine verses of the Old Testament and is always translated as “cedar” in twenty different English translations and revisions. Consensus by Hebrew scholars states that erez is always “cedar”. 1. Twenty three of the sixty nine verses identify erez as the cedar of Lebanon because the word Lebanon is either in the verse or the nearby context. 2. Twenty seven of the remaining forty six verses connect erez to construction and buildings, mostly the temple and royal palaces, where only cedars of Lebanon were used. Three of the uses are figurative but are still part of a building metaphor. 3. Seven of the remaining nineteen verses connect erez with religious activity; five with purification, one with sacrifice, and one with making an idol (Some have suggested that the juniper may be in view in Leviticus, but it is never translated that way). 4. In six of the remaining twelve verses, erez is used figuratively. But in each case, the cedar of Lebanon must be in view. It depicts the glory of Israel’s camp in the wilderness, describes the tail of the behemoth in Job, and refers to the majestic cedars. Only Psalm 148: 9 might refer to cedars in general, but the only cedar found in the region of ancient Israel is the cedar of Lebanon. 5. In the last six verses, the trees are planted erez trees. This includes Isaiah 9:10, where it seems clear that specifically cedars of Lebanon will be planted – but not pine trees in general. 6. The Bible does refer to other conifers but never as erez. Other words are translated as fir, cypress and pine, but never as cedar. Box tree = teashshur (evergreen, but perhaps not a panacea). The tree mentioned by Mr. Cahn is a specific kind and this erez tree according to biblical evidence (both in linguistics and grammatical application) is exclusively the cedar of Lebanon. The kingdom > phyla > class > order > family > genus > species. Yet the Bible states that each creature of God’s making is “after its own kind”. Thus humans are not related to armadillos in any way. See 1 Cor. 15:39; Gen. 1:11. Therefore we can conclude on biblical grounds that Norway spruce trees produce after their own kind and that kind of tree that is a cedar of Lebanon produces after their own kind. It is interesting to note however, that even if one adheres to the taxonomic classification system, the cedar of Lebanon belongs to the Pinacea family, in the Cedrus genus, of the Cedrus libani species. The Norway spruce is of the Pinacea family also, but of the Picea genus and the species of Picea abies. Two totally different kinds of tree that are not at all related on the genus and species level. Again, if one only examines the biblical text of Isaiah 9:10 and understands the history of the Assyrian attack on Israel, the parallel to the events of 9-11 is non-existent. There was one tree in front of a chapel that was destroyed via collateral damage, a merely incidental occurrence. The event that took place in ancient Israel was a decimation of vast forested areas in which these fig-mulberry trees (sycamores) that was both intentional and broad in its execution. [KAPLAN] “Who was behind the decision to do that?” I asked. While the theological beliefs and statements made at St. Paul’s on a regular basis or even such that were declared revolving around the event of 9-11 may certainly be called into question, the motives and intentions of both the Tree of Hope and prayers and statements made were in no way in defiance of God, but rather an expression of hope towards God. Mr. Cahn attempts to link prophetic relevance between the Scripture of Isaiah 9:10 with the planting of the Tree of Hope, suggesting (via his characters in the story) that it would be reasonable to plant another sycamore in place of the original, but the fact that it was “replaced with a tree of an entirely different nature” was a required fulfillment of prophecy; there is no such match, nor a harbinger fulfilled. ~ Fact Concerning Israel: Words of defiant pride and arrogance were uttered by Israel after the Assyrian invasion as prophesied in Isaiah 9: 9-10. ~ Claim Concerning America: When America’s leaders in Washington, D.C. repeat the words of Isaiah 9:10, they are proclaiming a vow that officially pronounces God’s judgment against the United States. John Edwards (vice presidential candidate at the time) at the Congressional Black Caucus Prayer Breakfast said the following words, which according to Cahn, Mr. Edwards was expressing (unknowingly…?) defiant words that paralleled the defiance of Israel in their reaction to the Assyrian invasion (for a complete reading of this speech made by John Edwards, go here). Cahn believes that Jonathan Edwards was openly defying God but at the same time . . . didn’t realize it (?). He makes such an assumption of Tom Daschle and his comments; that their words conveyed a meaning altogether different than the actual words that were spoken, even though the speakers themselves had no idea why they really were saying them (?). “… in spite of Edward’s clear intentions, God caused [him] to unknowingly pronounce judgment on America,” observed David James of Cahn's assertion. Not only did God cause these people who quoted Isaiah 9:10 in their speeches to say what they said, but Cahn even goes so far as to say that God caused Tom Daschle to prophesy judgment against America – something not even the leaders of ancient Israel did in their genuine defiance against the LORD. Further, Cahn asserts that a biblical “vow” – Hebrew: neder [noun form], and nadar [verb form] (the word “vow” is used 100 times, according to David James in The Harbinger) was uttered by the leaders of ancient Israel, and that this same type of vow was likewise proclaimed by leaders here in America; neither happens to be the case because a biblical vow involves the declaration of a promise or an intent either directly to God (Gen. 28:20; 31:13), or to another person with God as a (indirect) witness (Psalm 119: 105-106). ~ Fact Concerning Israel: Isaiah 9:10 as a whole was a prophecy; a word from God through the prophet Isaiah, concerning what would befall Israel. ~ Claim Concerning America: By quoting Isaiah’s prophecy against Israel, America’s leaders were likewise prophesying judgment against the United States in the wake of 9-11. This prophecy of Isaiah is claimed by Mr. Cahn to have also been proclaimed by Senate Majority Leader Tom Daschle in his speech made on 9-12-2001 (the day after the attack) as he ended the speech with a quote of Isaiah 9:10, but this is not the case. In the book and also in the dvd production of the book, some editing had been done that left off Tom Daschle’s last statements. By ending the speech with his paraphrase of the prophecy in Isaiah, it would seem more conclusive that his words match those spoken by Israel long ago. Cahn claims that not just prophets can prophesy, but that others who were inspired of God to record the Word in Scripture also conveyed God’s message to people. “Others can speak under inspiration,” says Cahn; he cites as an example, the high priest in his discussion with some of the Sanhedrin (John 11:49-51). The one problem with this is that this was in fact the high priest (as corrupt as he was) of Israel, and Daschle is not – he doesn’t even represent his nation as a spiritual leader of any kind: he’s a politician. Add to this, the proclamation of God’s Word with inspired and revelatory messages is done with; there are no more inspired words of God than what has already been recorded in Scripture and we could not find any even if we scoured the entire world, obviously not at the mouth of a United States Senator on Capital Hill! Daschle is not a prophet, he is not a priest, and he cannot claim to have had a revelation from God in any sense of inspiration as a declarative ‘word of God’. Assuming for a moment that Daschle’s words were a revelatory message from God, how would Cahn know that they were unless it was revealed to him by God? We know that the words spoken by the high priest Caiaphas were, but only because the Word of God said so! We have no such assurance from the pages of Scripture the same is the case with this American politician – only Cahn’s word for it and that is not nearly enough. 1) Israel was a theocracy, America is not; Israel was under a covenant relationship with the LORD and America is not. 2) As with any true theocracy, the political and religious realms were inseparably linked; such a linkage is precluded here in America due to the Constitution. 3) God used Caiaphas by virtue of his position as high priest, a representative of the people before God. America’s leaders are not spiritual leaders and represent the people before government, not God. 4) This situation with Caiaphas appears to be unique with no previous incidences or any following. This makes it impossible to be utilized to establish a pattern of the way that God works. 5) The true meaning of Caiaphas’s words did not contradict what he intended to, or actually did say. They simply carried more significance than he or those around him realized. Cahn asserts that Daschle’s words meant the exact opposite of what both he intended and what he actually did say. 6) Allegorical interpretation is a hermeneutical approach that disconnects the real meaning of a passage from what the words of the text actually say. The problem is that there is no objective measure by which we can weigh such words to ascertain how to interpret such words, nor to discern if such an interpretation is correct. In Cahn’s book, there are two sections and we have completed a review of the first. In the second half of The Harbinger, after having laid a foundation (chapters 1 – 13) of interpretations and arguments to support his assertions involving these nine harbingers of coming judgment, Cahn speaks of something called, “The Second Shaking” – God’s final warning to America before judgment actually falls. He also speaks of something called “The Isaiah 9:10 Effect” but neither of these are founded on credible exposition and hermeneutical treatment from the Holy Scriptures of truth. 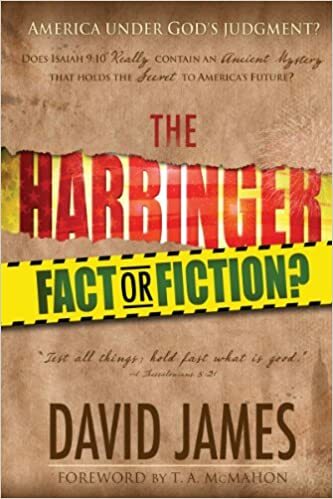 To learn about these other aspects, we here at TTUF would strongly urge you to get a copy of The Harbinger: Fact or Fiction by David James. For a synopsis of each chapter, David James has written the following for The BEREAN CALL. To order the book from TBC and to read a preview, please go here. A TTUF CONCLUSION – FINAL WORDS. We understand that the LORD GOD of ISRAEL is a HOLY and JUST GOD and because of His holy integrity as the JUDGE of the whole Earth, He cannot refrain from this obligation of judgment upon any and all sin. The LORD Jesus Christ Himself, though He is Savior and the Lamb of God Who takes away the sin of the world (John 1:29) has also been committed by the Father to be the Judge of the whole world; when He comes visibly to the world for every eye to see (Rev. 1:7) , He will mete out judgment upon all that have rejected His Gospel. We believe that America, like the rest of the world is under judgment by a Holy God that will be measured out at the appointed time (which is in God’s hands alone) but not because we have broken covenant with the LORD (there is no such covenant which the LORD established with any other nation except Israel, a statement replete in this series!) but because we have sinned against the LORD and His Law and rejected His Gospel which He has graciously extended to all peoples everywhere for the salvation of their souls. I believe that to whom much is given, much is required (Luke 12:48) and since America has been inundated with the Gospel and the Bible, we have been given much in the way of spiritual opportunity – and will receive the greater judgment therefore, having rejected (even mocked and derided!) such preciously Divine treasures! This is why it is imperative that we bring the Gospel to the lost on an individual basis for the salvation of each and every soul that will place their faith in the LORD Jesus Christ; we are not about ‘the salvation of cultures’ – they have no souls nor were they intended to be redeemed by the Person of Christ; these are only sanctified when a number of people have come to salvation and function properly as salt and light in any such culture. We may not be able to stay the hand of God in His righteous judgment, nor would we want to – but we can bring souls to the foot of the Cross and there proclaim their sins may be forgiven them by the shed blood of the Lamb, and at that Cross, they may see their own sin judged by God – and forgiven and washed away! We must also be aware of the growing movements towards Christian Nationalism, a sort of spin-off of Dominion Theology, where the church supposedly is commanded to “take back” our nation and restore it to its biblical roots (i.e., our supposed covenant with God as established by our Founding Fathers or Pilgrims of Plymouth?). Any movement that suggests anything other than simply preaching the Gospel for the salvation of souls and discipleship of the saints, who are saved by the blood of the Lamb, in the Word of God, must be scrutinized for such unbiblical ideas as “restoring America to her biblical covenant with God”. NOTE to TTUF readers, we will soon be addressing The New Apostolic Reformation (NAR) movement which has close ties with and adheres to Dominion style theology. God drags His feet when it comes to judgment; but sprints to deliver His grace and mercy. Read more! Friday, April 5, 2013, Dave Hunt drew his final breath and entered into the presence of our Lord and Savior Jesus Christ. His beloved wife Ruth was at his side. Born in 1926, David Charles Haddon Hunt enjoyed the advantages of a godly upbringing and placed his trust in Jesus Christ as his personal Savior and Lord in his early teens. As a young man, he served in the military toward the end of World War II. Afterward, he attended UCLA and received a degree in mathematics. It was during that time that he met the love of his life, Ruth Klassen. In 1950, they were married, and since both loved the outdoors, they enjoyed a beautiful honeymoon hiking in the High Sierras—perfect for two young people madly in love and with very little money to their name. Marriage was soon followed by the birth of two sons and two daughters. Ruth was a busy mother and also a gifted writer herself. She had a tremendous interest in and knowledge of history, a gift that would help Dave further down the road. Dave’s own career path led him into a position as a CPA/management consultant and later as the manager of several corporations. Along with church-related activities, Dave initiated and became involved in numerous campus ministries and meetings in their home, with a special outreach to Jewish young people and foreign students. Many of these have stayed in touch with Dave and Ruth through the years, fondly recalling their times spent in Bible studies at the Hunts’ house. Dave and Ruth also traveled abroad, spending time in various locations throughout Europe, meeting with believers there and ministering in many ways while raising their own family. Dave also brought Bibles and other materials into the Soviet Union during a time when it was very difficult to do so. Throughout his later years, he and Ruth traveled extensively as he was invited to speak in churches and fellowships, large and small, all over the world. Often they stayed in people’s homes, dining with them, learning their customs, and sharing God’s Word and God’s love. 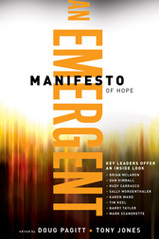 The following article is a critique on the chapter “The Existing Church/Emergent Church Matrix” written by Emergent Leader Tim Conder. Tim Conder is the pastor of Emmaus Way, an emergent community in Durham, North Carolina and remains a standing elder and friend of the Chapel Hill Bible Church, a fellowship he co-pastored for fifteen years. Tim is a member of the coordinating team for Emergent Village, a member of the board of directors of Mars Hill Graduate School, and the author of The Journey of Existing Churches into Emerging Culture (Zondervan, 2006). He is married to Mimi and they have two children Keenan and Kendall. As has been consistently demonstrated in all of the articles thus far presented, the Emergent philosophy is very ‘horizontal’ in its perspective. Think about the various ‘gospels’ that are promoted today: The Green Gospel, the Social/Social Justice Gospel, the Liberal Gospel, the New Age/Spirituality Gospel, the Dominionist/Kingdom Now/Latter Day Rain Gospel . . . one thing (among others) that they all have in common is that they are all very ‘horizontal’ that is, they deal to a very large degree in focusing on change among human beings rather than change in human beings. They emphasize relational alterations between people and people groups and desire to bring about change (especially where biblical Christianity and world view is concerned) via consensus, dialogue and finding ‘common ground’ through the production of ‘stories told’ that are in their mind inspired in much the same way as the ‘stories’ people told in biblical times (in case you didn’t catch that, this is how Emergent folk refer to the Bible, the Holy Word of God!). Such gospels and perspectives have very little, nothing in fact, to do with the living God in accordance with Truth. We understand that any relationship with the LORD must be one of worship and we must worship Him in Spirit and in Truth (John 4:24). Yet there are many within the ranks of the Emergent Movement that have found a home in the midst of such a belief system, and are actually “blessed” to be a part of this! Tim Conder comments: “I have been privileged – no, downright blessed – to be a leader in Emergent Village and its organizational forbears for now approaching a decade. Like many in this community, though, my passion and enthusiasm for its values had greatly predated some of the first national gatherings on ‘Generation X ministries’ and ‘the postmodern church’ that served as public unveilings for what would become the emerging church movement. I have watched this community experience so many metamorphoses – from being virtually unnoticed to struggling to manage the interest generated, from predominantly deconstructing traditional Christianity to have a seat at the table in many institutional expressions of Christianity, from being defined by its ideological differences and eccentricities to being identified by the creativity and impact of its communities. . . The citizenship that all true believers have obtained has been as a result of no cost of our own, but by “the blood of Christ” and it’s to the kingdom of God that we owe our allegiance, not to any ‘dual-citizenship’ between more traditional denominations, mainstream evangelistic and the more heretical body of the Emergent Church/Village that espouses an extremely liberal, humanistic bias of the Scriptures. They are in fact “deconstructing traditional (read that, biblical) Christianity” and that is the point of the Emergent Church – they rightly perceive that the biblical Gospel of Jesus Christ is highly offensive (and supposedly “not relevant” or ineffective) in this postmodern culture that has flourished in the seed bed of the American Public School system. Secular humanism is the norm there, and evolution is taught as science fact, planted in the fertile minds of our youth (To understand the parameters of this evil environment that is our public school system and the goals of those who have developed it, visit TTUF’s series on this subject by using the search engine and type “EDUCRATS” – three articles will appear for your perusal); so that the Emergent Church has begun to reap this corrupt harvest and as well as this, has made a new set of clothes for such an anti-Bible society, tailoring it with treacherous heresy and an outright denial of the fundamentals of the faith (the Deity of Christ, the atonement of Christ on the cross, the creation account, etc.). “The gulf of interest and trust between the emerging church and the landscape of existing churches of all traditions seemed immense and insurmountable” stated Mr. Conder, and for good reason: the two groups have entirely different foundations! One is founded upon the Rock, the LORD Jesus Christ and His Word (Matt. 16: 16-18; John 8:31; 14:6); the other is founded upon “philosophy and vain deceit of men” (Col. 2:8). Behold, the Hegelian Dialectic in action! This phenomena is used prodigiously among political, religious, economic and civil authorities and bodies; one takes a thesis, say biblical creationism and then an anti-thesis as ‘scientific’ (more like scientism really) evolution and then merge the two in a synthesis: theistic evolution.The same can be said for another Hegelian Dialectic that is becoming more popular these days: thesis – Christianity; anti-thesis – Islam; synthesis: Chrislam. So this matrix that Mr. Conder envisions is yet another merging of these two (somewhat) opposing views of traditional churches (more or less compromised, apostasized, homogenized with heresy) and the emergent church (same thing but more blatant and lauded by people of other religions and religious leaders like the Dalai Lama) and merging these into the sinister synthesis of what the Bible declares as the Whore of Babylon. Something we have probably all realized by now is that the Emergent Church heavily endorses something that has been brought about by Roman Catholic (“desert fathers”) that is now called contemplative prayer (spiritual formation), an exercise in the occult that belongs to the “mystery” or “esoteric” schools of many different societies throughout the ages. Thus the appellation of this “Mother of Harlots” that includes “Mystery” and “Babylon” is most telling. This Emergent Church Movement will eventually bring about the formerly biblical churches to Rome and find union with the Roman Catholic Institution, which in itself is Babylon and will incorporate the world’s religions into a singular whole or ‘Babylon’; ready for the false Prophet to take the lead in bringing adoration to the Beast (Revelation 13: 8, 11-18). These collisions are apparent in any Hegelian Dialectic and certainly no less in today’s churches that are gravitating towards emergent beliefs and practices; the thing is, in an ordinary automobile collision, there are still two vehicles with certain levels of damage; yet in these sort of ecclesial collisions the biblically viable church is the one damaged and the emergent counterpart is the one that absorbs it into itself, creating a whole apostate system. 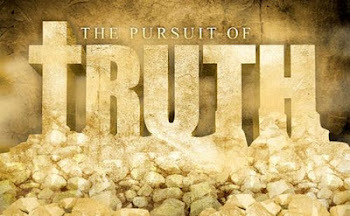 The gospel of the church of Jesus Christ is not at all the gospel of the emergent church; their method of epistemology is wholly counteractive of what this system of study is for the true church, which believes that truth is real, propositional, clearly recognizable and understandable and immutable in all eternity. The emergent church believes none of these things, or at least not within the biblically defined parameters. Here is a chart that Mr. Conder has constructed that demonstrates this even further. Where in the Scriptures does it speak on the duties of the church having to do with the environment? Certainly we are to be good stewards of all that God has given to us, and this would obviously include our planet, and each of us must be responsible with how we use resources, proper disposal of trash, etc. However, corporately as the church, we are to “be about [our] Father’s business” which is the salvation of souls, the discipleship of saints, being salt and light in a corrupt society; this applies on an individual level as well – and this is also the allocation for personal conscience regarding how involved we should be concerning the environment. Other issues like poverty – the church has long been the source of charity throughout history and even at such recent times and tragedies like Hurricane Katrina, it was the churches that stepped up and helped those in need when our own Federal (FEMA) government botched their seemingly half-hearted efforts. It was the same thing during 9-11, and other devastations. There are scores of Christian charities that send multiple millions of dollars to the poor and needy the world over (both Anne Kisly and I are sponsors to help deprived children overseas and bring them aid spiritually, intellectually and physically. What about racism? This is really a non-issue once a person comes to Christ and is spiritually transformed from sinner to saint, from child of darkness to child of light. I have personally known people who were horribly bigoted and hateful towards others because of skin color and, or religion – but once these came to Christ, such hateful beliefs and motivations were stripped away and there was genuine, Christ-like love for people that were once hated! Such is the miraculous, transformational power of Jesus Christ and His glorious gospel! Yet the emergent church sees these as issues that need to be dealt with; and how would they go about dealing with these issues, through such carnal methods as education and social action? These social problems can’t be solved directly or with lasting results and even if they could be – such would be a short lived victory that would end at death and without saving grace would send all unrepentant participants in ‘social action’ to an eternity in hell. Such a statement obfuscates and degrades what the Bible says of itself, that this is the very Word of God and should be received as such by all Christians (1 Thess. 2:13) who recognize that Jesus Christ is the Word Incarnate, and that this Word inspired the writers of Scripture by the Spirit of God; it places the wisdom of this Holy Book down to a level of “theological systems” which guide interpretation, when in fact we must recognize that the Inspired Scripture alone, which is the very Word of God guides our interpretation. Christians no matter what level of authority they may (or may not) possess has no authority to interpret Scripture as they see fit (2 Pet. 1: 19-21); we let the context of the entirety of Scripture to interpret the individual passages, or put in another way, we allow Scripture to interpret Scripture. I’ve often said when leading any Bible study, in encouraging the saints gathered there to engage in their own personal study, and when they do – they have the best set of commentaries possible when they examine any one book of the Bible; sixty five other books in fact to provide insight and commentary on the book they’ve decided to study, and those are the other (sixty five) books of the Bible! This is not to say that “theological systems” are invalid, just the unbiblical ones are! We must never take any such system for granted, but as with any and all teachers who might provide such systems, we are duty bound to “search the Scriptures daily to see if these things be so” (Acts 17:11). That is one of the trademarks of the Emergent Church; that while they may give lip service to the inspiration of Scripture and show some (usually) small level of respect for the Bible, their view of the Holy Word is almost always rather low; quite the opposite of God’s view of His own Word, which He exalts about even His most Holy Name (Psalm 138:2)! “The existing church must find its way into the emerging culture to retain its missiological credibility or perhaps even to survive. The emerging church’s formation is delayed despite significant demand for its presence and passions, by the opposition of the established, existing church,” says Mr. Conder. 1) The word “must” used for the existing church to find its way into emerging culture for starters; the church of Jesus Christ “must” not follow or obey or receive counsel from anyone or any “theological system” other than the LORD Jesus Christ and His written Word, for it is Christ Who is the Head of the church (Eph. 5:23; Col. 1:18) and her Redeemer (Gal. 3:13; 1 Peter 1:18). He paid for us with His own blood (Acts 20: 28) and therefore no one has even the slightest authority to dictate terms to her, particularly those whose counsel runs counter to the Word. 2) The church has never found credibility in the eyes of the world; her words were never heard by those who belong to this world system under Satan, just as our LORD told us. Only those who are “of God” will hear our words, but those who are not, will never hear us, but hate us (John 15: 18 – 25; 8: 46 – 48). 3) Mr. Conder talks about the church “surviv[ing]” and expresses concern that she might not unless she changes her “missiological” position. Not to worry Mr. Conder, the church of Jesus Christ was founded upon Himself, the Rock (Matt, 16:18) – and she will most certainly survive without any emergent assistance (rather flourish more properly without its corrupting influences! 1 Cor. 5: 6 - 8), even though the gates of hell would seek to prevail against her. There is no need of emergent wisdom when we have that superior wisdom that if sent to us who ask for it, from the LORD Himself (James 1:5, 14-18; see also 1 Cor. 2: 12-14; 3:18-20; 2 Cor. 1: 11-13; Eph. 1: 8, 17; Col. 1:9; 2: 2-4). Needless to say that a compromised, lukewarm church that has left their first love is the fertile and quintessential breeding ground for apostasy! 5) Who is it that is demanding the “presence and passions” of the emerging church? For the most part, Postmodernists who disparage the idea of absolute truth, of the inerrancy and infallibility of Scripture, of the Divine claims of Jesus Christ and His virgin birth and glorious resurrection; those who are concerned with the here and now to the exclusion of eternity. Those who are making such demands care more about social action than salvation, about reformation of the wrong kind of spirituality rather than repentance from sin as defined by the Law of God (and not political correctness); they care more about cleaning up the environment than cleansing themselves from evil works. These are the sort that are demanding such a “presence and passion” from the emergent church, they who “earthly things” (Phil. 3:18-20). For myself, I much more prefer the presence and passion of the Holy Spirit and of the precious Word of the LORD Jesus Christ! 6) And as for “opposition” there is much to say! The fact that Mr. Conder recognizes that there is an opposition between the Emergent Church Movement and the established evangelical church reveals the truth of the matter; simply that there is something substantial and significant to oppose! Those who love the Word of God, the very Word of Truth, who understand that there is an objective and absolute Truth to know, believe and obey will never seek to compromise or mediate the Truth. Jesus Christ said of Himself that He is the ROCK, the ROCK of the church; in passages in the Old Testament, such words as “the Rock of our salvation” recur with regularity (Deut. 32:15; 2 Sam. 22: 3, 47; Psalm 18: 2, 46; Psalm 62: 7; Isaiah 17: 10 and others). The Scripture also states in the Old Testament that if an altar is to be built of rock, it must be unhewn rock (in other words used ‘as is’ without any embellishments) and if any would use a carving tool to shape it into something other than it already is, that rock is invalid for use in worship (Exodus 20:25). Now in the New Testament, we worship as the altar of Christ, represented in the worship of the saints, but we cannot ‘alter this altar’ by seeking to change the image of Jesus Christ as given us in the Scriptures. Any who seek to bring “another Jesus” (2 Cor. 11: 3-4) by altering Who Jesus is, what His Word means, what His mission was, is and will be – if we do this, we pollute who Jesus is and such a Jesus, an ‘altered’ rock is invalid! And we the saints of God will always and ever oppose those who seek to change JESUS the ROCK of our SALVATION and HIS LIVING WORD sent to us His church! Certainly that is true to some extent, at least perhaps where church function is concerned; there are those who ask “Where is the position of a ‘senior pastor’ mentioned in Scripture? Or “Sunday School” or “Youth Group”? The simple answer is that there isn’t any to be found; that these are Western derivations found in the church. Does this mean that the LORD can’t use such functions and positions? No, I don’t believe that this is the case, however we must be careful in understanding what is explicitly found in Scripture for the direction the church is to follow and what is not found, and where it is not found, we must weigh soberly its ramifications. As for a “pure gospel” unaffected by culture, it has been my personal experience having gone abroad and ministering the Gospel to Muslims, Hindus, Sikhs and New Agers alike, that this message is universally applicable and needed no such alterations, nor was it in itself altered in order to accommodate these different cultures. The Gospel message is a ‘one size fits all’ as far as its presentation is concerned – and that would also include the ‘Generation X’ and Postmodern populace! As stated previously, the only reason why Emergents want to change the Gospel, and the very heart of the church of Jesus Christ is out of a misguided belief that in order to affect this generation we must reach them where they are at. The problem with that is that the present generation along with these groups just mentioned have been inundated with public school indoctrination and most especially evolution; along with this, a steady diet of humanism, values clarification and situational ethics, being taught that truth is relative and personally subjective according to the individual. We cannot suit this generation by tailoring the Gospel in order to fit their views! What must change is NOT the GOSPEL and the collective Scripture of the WORD of GOD nor our view of it as the church! What must change is the heart of this generation in a spirit of meekness and repentance; we as the church must expose the LIES of evolution (I prefer the spelling ‘evilution’ myself), and relative truth, and the amoral ethics that have permeated our society. NOTHING BUT THE PURE GOSPEL OF JESUS CHRIST CAN AND WILL DO THIS! In order to bring this pure Gospel, unaffected by our culture, we must simply remain faithful to what the Word of God dictates in the parameters of the Good News of Jesus Christ! We cannot afford to ‘dialogue’ away the Gospel by meeting and associating with other groups that are opposed to the Gospel, nor can we establish a consensus to compromise this Word of God. “In a climate of theological openness, emergent passions would certainly have greater credibility because of the sheer volumes of persons who share them,” states Mr. Conder. So there can be credibility by popularity, even if those “sheer volumes of persons” are wrong as the Scriptures prove true? This is the very stuff of Laodicea, where the “rule of the people” dictates ecclesial policy instead of the Head of the Church, Jesus Christ and such can never have any credibility in the eyes of God – nor in ours who love Jesus Christ and His Truth. So ends this final section of this treatment of this book An Emergent Manifesto of Hope; of course there is a lot more said in this book than what I have examined in these five parts, but the essential spirit of the ECM has been exposed sufficiently so that the biblical reader will understand the basic framework in which this movement operates. I believe, as does Anne Kisly, co-writer of TTUF, that this Emergent Church Movement is a tool used by Satan to amalgamate and blend what was the faithful evangelical church into an apostate body that will itself merge with the Roman Catholic Church (which is absorbing Protestant denominations in increasing degrees - and form what we know the Scriptures refer to as a one world religion (See Revelation chapters 17 and 18). Now that there is a Pope who is of the Jesuit discipline, we can only expect this process to be expedited in these last days before the return of the LORD JESUS CHRIST. He has already sought for a greater presence in Israel for Roman Catholicism. 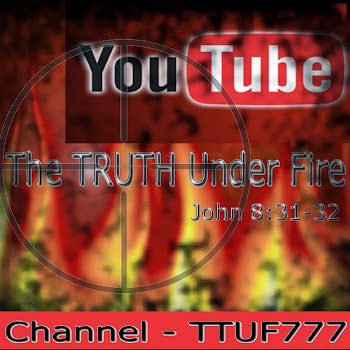 It is the expressed and heartfelt prayer and hope of TTUF that those who are born of God’s Spirit, and who love and follow His Word will remain vigilant and prayerfully determined to stand against any and all emergent and apostate philosophies and directives. Faithful no matter what the cost; even if we must stand against the authorities in our churches (meekly, not arrogantly), even if we lose friends and allies, even if we are labeled as “unloving and divisive and judgmental”, even if it means our persecution or (perhaps eventually) the forfeiting of our lives! Our lives are the LORD’s any way, to do with what He desires, so let us hold fast to the Word of Truth at any and all costs! AMEN! Read more!